Rhubarb is one of my favourite spring fruits. Well I know technically it’s a vegetable, but most of us use it as a fruit so it’s easier to refer to it as such. We used to grow a champion crop, but for some reason rhubarb has never taken to our new plot and refuses to grow; I say new but we’ve had it nearly 9 years now – eek, how time flies. So when we had some gorgeous bright red sticks included in our veg box the other week, I got very excited. My first thought was cake, my second was chutney. Luckily I had enough to make the remarkable rhubarb cake you may have seen in my last post and two and a half jars of rhubarb and ginger chutney – win win. The colour was truly amazing. I’ve made rhubarb chutney before and it usually comes out a rather sludgy brown colour, which isn’t the most visually appealing. This one however was a surprising bright pink. It tastes delicious too. So here is how you can easily make your own. If you’d like to see more preserving recipes, you’ll find plenty of them on my fermented & preserved Pinterest board. Thanks for visiting Tin and Thyme. 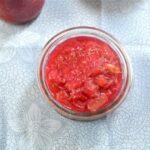 If you make this recipe for rhubarb and ginger chutney, I’d love to hear about it in the comments below or via social media. Do share photos on your preferred social media site and use the hashtag #tinandthyme, so I can spot them. For more delicious and nutritious recipes, follow me on Twitter, Facebook, Instagram or Pinterest. A superb speedy chutney that is quick to prepare and quick to cook. It adds a fresh and spicy kick to cheese, roasted vegetables and many other dishes. It also goes well with curry. Place all ingredients into a medium-sized saucepan and place on a low heat, stirring occasionally until the sugar has dissolved. Bring to a simmer and leave to cook uncovered for 15 minutes or until the rhubarb has collapsed and the mixture is no longer watery. Stir occasionally. Pour into warm sterilised jars and seal. Store in a cool dark place for up to six months. Although like most chutneys, this is best left to mature for a while, it's still good eaten on the day of making. I’m sending my rhubarb and ginger chutney off to the No Waste Food Challenge normally hosted by Elizabeth’s Kitchen Diary. In June and July, however, Utterly Scrummy Food for Families is hosting. If you have loads of rhubarb this is an excellent way of using it up. You can double, triple or quadruple the quantities and enjoy a taste of early summer later in the year. I tend to prefer home made chutney too and make lots of rhubarb or courgette chutney when I can. Lovely recipe C.
Thanks Bintu. Courgette chutney is a new one on me, but what a good way to use them up. Oh wow… jars of joy indeed!!!! I’m a huge sucker for home made chutney, haven’t made it for ages though! I’m SO going to back a batch of this as it looks totally lush. I am thinking about all the different things that I can put this on. A great way to make the most of rhubarb season. Damn, that looks good! Love love love rhubarb and it has to be one of the easiest plants to have down the bottom of the garden! You’d think so wouldn’t you Janie, but we can’t grow it for love nor money. Ah, cardamom suger is super easy and smells gorgeous. Just put a handful of cardamom pods in a largish jar and fill with golden caster sugar (or granulated). Leave for a week to infuse. I have a permanent jar on the go and just top it up with sugar as soon as I’ve used some. This looks amazing! I love rhubarb and you’ve reminded be I have some in the fridge from my parent’s neighbour. Rhubarb crumble it is! Hope you enjoyed your rhubarb crumble Jac, you’ve really got my mouth watering now. I love chutney and I love rhubarb but never thought to combine the two. I am very into jams and preserves this year I have to make this! There is something so satisfying with a shelf lined with homemade preserves Lucy – I love em. 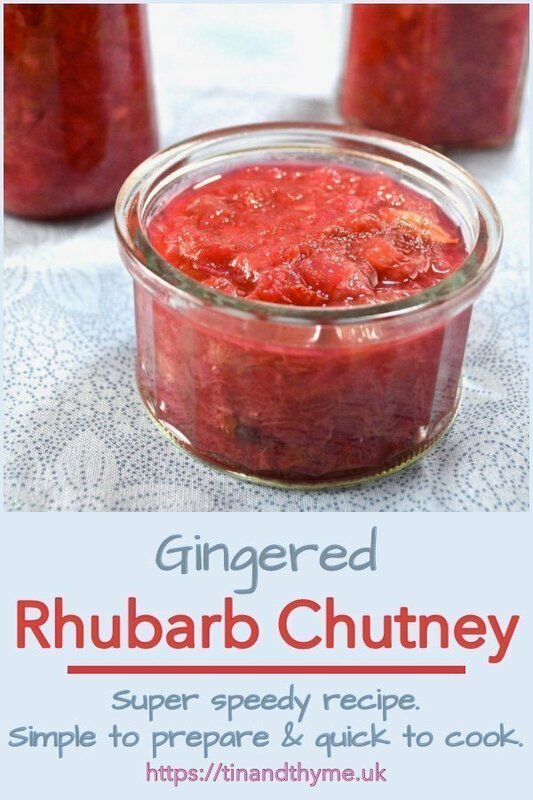 I adore rhubarb and ginger chutney, I must try making this sometime. It looks fabulous, so pink and Summery. Thanks Vicky, rhubarb has such a good flavour for so many things. That looks so vibrant. Far removed from sludgy looking shop bought chutneys. I need to make me some. Oh good luck Nayna. Some rhubarb growing neighbours would be good. I love the combo of rhubarb and ginger … this chutney must be extremely tasty. Ah, that’s interesting. I guess the season started earlier in France than it did for us. Now wondering what you did with all of yours. That is SUCH a stunning colour and the combination of rhubarb and ginger is always a winner here. Our rhubarb (and when I say our I mean my neighbour Tracey’s) hasn’t performed well this year… no idea why, so I need to find someone else to steal from! Oh how annoying. We can’t seem to grow rhubarb in our new (8 yrs) plot at all. We visited friends today and came back with the most ENORMOUS sticks I’ve ever seen – 2 large crumbles per stick I reckon! 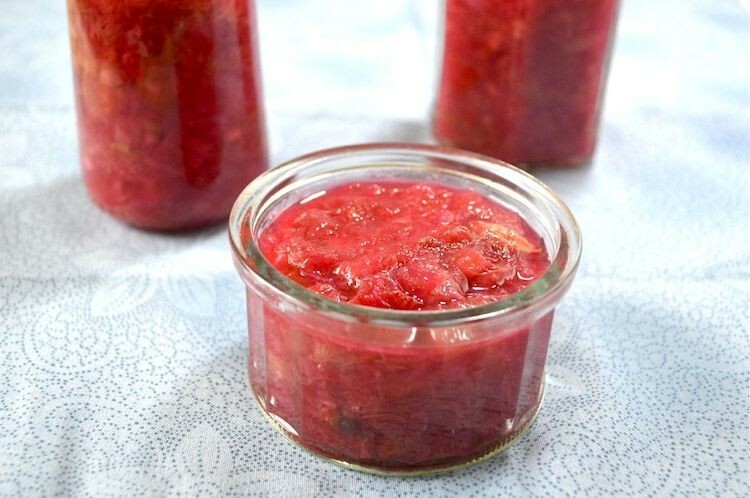 I love rhubarb but have never had it in a chutney before – love the combo with ginger. Oh, you’re missing a trick CC, rhubarb makes a fab chutney. This is a perfect combination. Can’t wait to try it out my family. Thanks for sharing, kudos!!! Thank you Janet. If you like rhubarb, you’re bound to like this. I think the ginger with the rhubarb must be a delicious combination! I love rhubarb and we had a patch in the garden when I was growing up. I really miss it now as I’d love to use it more often and I often forget about it when it’s in the shops. I really miss the rhubarb we used to grow, it was fantastic. For some reason we just can’t get it take in our new plot, so I’m reliant on friends for mine. Thanks Kate. Pear and ginger sounds delicious – pretty much anything with ginger does if I’m honest 😉 I was really lucky to get hold of some bright red sticks, so I didn’t end up with a sludgy colour. If you like rhubarb (and maybe even if you don’t) it’s a great relish to make. Sadly ours is all gone and I’ll have to wait for next year now.